It was sunny, and rather warm despite the encroaching fall. Scyldie, having been cleared past the guards at the iron gates, walked through the yard and up to the house's front door. She stood there for a moment, closing her eyes and drawing a deep breath. The door was made of metal, and separated in the middle with a line that curved slightly at the ends. This kind of explicit ornamentation was common among the elite of the Sarpati extended family, who liked to flaunt their loyalty and heritage pride. On this planet, under Serpentis control, it never hurt to advertise your allegiance. Scyldie's knock reverberated through the door but was met with no response. For a moment she wondered if all this trouble had been for nothing, if she was going to be turned away at the final checkpoint. It would be a bitter relief. Then the door opened, sliding soundlessly apart. Inside was quite a homely apartment, full of furniture that looked like it had been in the possession of the same family for a number of generations. Scyldie walked in. The door closed behind her. The smell of tea drifted in from a nearby room, as did murmured voices. Scyldie slowly walked in that direction. It turned out to be the parlour, where two women sat drinking from thin porcelain cups. One was settling nicely into her middle age, while the other looked as old and worn as the furniture. There was a third chair, and a small table that held a tray of biscuits, a tea pot and an extra cup. The two women did not look her way when she entered, but finished the muted conversation they were having. They then put their cups down on the table, folded their hands in their laps, and stared at Scyldie. She was about to say something, but checked herself and stayed quiet. Eventually the younger of the two women, who Scyldie knew was called Verdinia, spoke in a matronly voice. "Do take a seat, dear," she said. "Would you like something to drink?" Scyldie sat, picked up the empty cup and held it towards the pot. "Please," she said. Verdinia leaned over, picked up the pot and poured. From the corner of her eye, Scyldie saw the other woman stare at her. It felt like a bit of an anticlimax, after all the layers of security, bribes and sweet-talk she'd had to get through. But then, Scyldie thought, these women would be well aware of the effort needed to see them. Besides, she had a good feeling that behind those facades lay steel jaws and steel minds, and her intuition rarely led her wrong. "Nice weather outside," Verdinia said. "So far," Scyldie replied and, before she could stop herself, added, "We're in for a storm." The two women glanced at one of the windows. Golden sunrays pierced the curtains and lit the room. "I'm sorry for your loss," Scyldie added quickly. "Wasn't your fault," the other woman replied. Her name was Aursula, and she reminded Scyldie of an old schoolteacher. "And it was a while back now. We've gotten over it." "I'm sure you have." Scyldie took a sip of the tea. It was hot, and very strong. "I mention it both for its own sake, because I think that paying one's respects is important, and also because I don't want my proposition to seem inappropriate." "I'm sure whatever proposition you make will be quite appropriate, dear," Verdinia said, not quite disguising the amusement in her voice. Scyldie ignored the sarcasm, took a deep breath and said, "There are two of you. There used to be three, before the accident. I want to fill that gap." When the two women didn't comment, she plunged onward. "I know who you are. I know that your husbands are men of power in this organization, but that they haven't quite risen to the top and so neither have you. I know you've had a fall from grace as of late, what with you being diminished. I can help you with that." "Do you feel diminished?" Aursula asked Verdinia, ignoring Scyldie. "Not at the moment," Verdinia replied. "Should I?" Scyldie's nerve finally broke. "Look, I want to help you two, and as it happens I've got quite a lot to offer. My husband is currently on a very important mission, and once he's done he'll be in a position to take us all to the top. I'm not a liar, nor pretending I'm someone I'm not." Aursula retorted, "You use a lot of fancy words, young lady, and people who use fancy words tend to be hiding behind them. I see no reason why we should give you anything." "Except a cup of tea," Verdinia interjected. "One must be civil." "Yes, of course," Aursula said. She took a sip from her own cup, then put it back on the table and, turning to Scyldie, laced her fingers together on the chair's armrest and said, "First of all, I'm sure you are who you are, whoever that is. I believe the last person who tried to gain entry on false pretences found themselves leaving this house in ... three, was it?" She glanced to Verdinia. "Four pieces, thank you. In separate bags. Second, though, I'm not sure you even know what you're talking about. Have we advertised for help? Have we actively sought your assistance, your interference in the way we run our business?" "You didn't have to. Word among those who know is that you're already one person short." "Do you believe everything you're told?" Aursula asked. Scyldie fixed her with a glance that she hoped appeared more confident than she felt. "Only the things worth hearing," she said. Aursula fell silent at that. "What have you heard, dear?" Verdinia said, while dipping a biscuit into the tea. Scyldie reached for another biscuit, nibbled on it a bit, then said to Verdinia, "Your husband is the premier accountant in the firm, and as everyone knows, accountants for people like us are worth their weight in megacyte." "I like how you said 'people like us'. That was nice. I feel closer to you already," Verdinia said. "But his problem is that he has nowhere to go. He's risen to the top of a section that's largely self-contained, and his power stems from the insight and inside knowledge he has over the workings of the organization, not from his own authority. If he gains allies in other sections then he can become immensely powerful, but if he's left without enough friends then his enemies won't think twice about muscling him out." "My goodness," Verdinia said, and dipped her biscuit into the tea again. "Your husband, on the other hand," Scyldie said, turning to Aursula, "is very much in a position to command other people. The way he managed to bridge the gap between our administration and internal security departments is quite admirable, and I know he has the respect both of his men and of Raikanen and Tuvan. But that isn't enough." "Is anything enough with you?" Aursula said, but without much spirit. "Since he's caught between those two men, both of whom are some of the highest-ranking individuals we have, he's rendered powerless. His own authority doesn't extend outside of his own cadre, and while he's got some leeway in how to interpret the commands he's given from higher up, he's basically their Slaver hound. He says what he is told to say. He's managed to maintain this appearance of power because of the loyalty he's gained with the troops during his years of fighting for us, but with the new people coming in, all that his presence will engender is resentment. He doesn't have their loyalty, and he's in no position to gain it." Scyldie took another bite of the biscuit, forced herself to pause a bit. The other two waited, looking unimpressed but listening nonetheless. "Back when you were three, that was different. You had someone else, a woman who was a little older than I was, who could stay in touch with the newer recruits and constantly refresh your power base. Now, I'm not implying that she wasn't good enough, or that her actions somehow landed you in this predicament-"
"Yes, you are," Aursula said. "But she made some mistakes, and you stopped rising. And now with her loss you risk a fall. As much as you may want to return to the old days with her, that's not an option anymore. Word among the young recruits is that you're on your way out, and while that can be changed, it has to be dealt with in an active manner." "You seem to be an active person yourself," said Aursula. "Even if you can't read the clouds for naught." "I look at things the way they are, including the weather I should add, and not the way I'd like them to be," Scyldie said. "I use that dichotomy for motivation." "Do you now, dear?" Verdinia said. "I mean, I see what I want, and I work hard to get it. I don't sit and wait for things to get better. The world doesn't owe me anything." "Damn right," Aursula said, nodding. Verdinia, other the other hand, did not nod, nor say anything. She merely stared at Scyldie for a little too long. At last she added, "Well, it's all a matter of perspective, isn't it? You can take a single event and think of it in one of two ways, good or bad. The experience is all in your mind. It may appear terrible to others, but to you it could be the start of something good." Scyldie filed that away for later thought. "Maybe, but more often than not it's far too tempting to look at life through rose-tinted glasses, instead of the cold and harsh place it's turning into." "Do you have any children?" Verdinia asked. Scyldie blushed, and said, "No. We haven't quite gotten to that part yet." "I suspected as much, dear. Now, tell us what it is you believe you can do for us." Scyldie shifted in her chair. This was the selling point; this was the moment of truth. "My husband is a pilot for the Serpentis forces," she said. "Top of his class, excel and merits, crew is loyal to the death. He's very popular with the other captains as well." "Good for him," Verdinia murmured. "He has that mix of leadership and communication that makes for a good agent in our organization," Scyldie said. "He's ready to stand up for his co-pilots when needed, but he knows when to stay seated. People look to him for validation, and accept his authority even when he doesn't have it. And nobody dislikes him, or says so outright, at least." "Sounds like a good man," Verdinia said. "I hope you two have a nice life together. But why are you telling us this?" "Because we can help each other. My husband needs better contacts, particularly after he's done with this mission. Otherwise he might stagnate, or worse, run the risk of associating with the wrong people. And he can swing the younger recruits your way, persuade them that your husbands are the ones they should support and respect." "So we're not the wrong people?" Aursula said. "Well, that's a relief." Scyldie bit her tongue, took a slow breath and said, "I think it's time you took in a third woman in this coven, and it should be me." 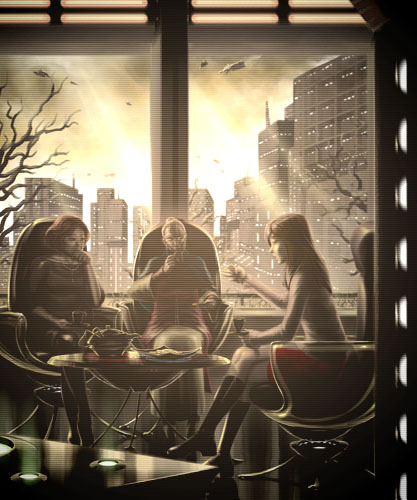 Verdinia had a sip of tea, smiled prettily at Scyldie and said to her, "No, dear. I think it's time to kill you." In the stunned silence that followed, Verdinia said, "You clearly know a lot about this organization, and yet in your hubris you think that it needs you. I remember that feeling, from years past. But you've now put yourself in a position where you've revealed your intentions without having a shred of proof that you can back them up. What happens if your husband fails in this important mission of his? You know full well that we can't associate with failures. So you get turned down, and you become our enemy, likely as not to make your husband poison our cause. We can't have that, dear. We can't have that at all." "We don't even know if he'll make it back alive, let alone successful," Aursula said. "Unless we're sure of his position and power, we couldn't possibly consider offering you a place here. What would we do if he screws up and loses the loyalty of his people? Should we keep you around as a pet?" "No, of course not," Scyldie said. "He won't lose. I know it. He won't. And he can be very valuable to you. We both can." "Look, dear, I'll be completely honest with you. We do keep tabs on some of the young officers and their families, to make sure that they don't get too big for their shoes and try to fill ours instead. And now we know that you're an extremely ambitious young woman, one who managed to find her way to us. We can't have you begrudging us our position, which you will if your husband achieves anything less than stellar success and we end up turning you down. It's nothing personal; simply the rules of the game." "Look, my husband is going to be fine! He knows what he's doing, and I have faith in him." "Faith isn't enough," Aursula said. "Then call it intuition. Or, I don't know, deeper knowledge." "There's a lot of things you claim to know," Aursula said. "I kno- ... yes. But that is how it is." "What assignment was it that your husband was going out on, dear? The secret one that brought all this about." When Scyldie hesitated, Verdinia continued, "You know that we can find this out. I'd rather it be from you." "Well ... he's been sent after someone who keeps going to our meet-up points and attacking our ships." The two older women looked at each other, then back at Scyldie, but said nothing. For a moment they all sat in total stillness, broken only by the noise of the wind trying to force its way through the windows. "You didn't mention that, dear," Verdinia said in a gentler tone. "I didn't realize it mattered," Scyldie said, adding a slight tone of pique to disguise her sudden nervousness. "He was quite unwilling to tell me about the particulars." "Tell you what," Aursula said. "When you next hear from your husband, see if he's in one piece, then contact us again. Someone who can take on capsuleers is someone we would be interested in, success or not." Scyldie nodded and stood up. "I think it's best I go now." "I agree, dear. Do let us know how your husband does." "I will." Scyldie headed towards the exit, and the older women followed her. When she got to the door, she turned to them and said, "You know, I'm surprised you were this hostile to the idea. I can't even imagine the things your last companion went through when proving herself." Verdinia and Aursula looked at each other with the strangest of expressions, then looked back at her. Aursula said, "That's right. You can't," and waved her hand in front of a small scanner tab. The door opened. As Scyldie stepped out, something about their expressions nagged at her, as did Verdinia's earlier comments about perspectives on horrible events. She looked over her shoulder to the women and said, "By the way, how did she die, again?" Aursula smiled, or at least showed her teeth, and said, "That's a very good question. Let's hope you never have to find out. " And the doors closed. Scyldie stood outside, a new wind whipping at her clothes, and felt the darkened bloom of realization unfurl in her mind. She would have to push hard at this, all the way through, and ensure that she could work with these people until she'd get to a position where she could dominate them. Otherwise she would never be safe. And it would all depend on her hunches and insight, more than ever before. Intuition or death. Another gust of wind blew by, giving her a chill. She pulled her coat tighter and looked up at the sky, and what she saw made her burst out in laughter.